LTTHTGP means "Late To The Halloween-Themed Game Party," by the way. Just in case any of you were wondering. What does that mean, you ask? 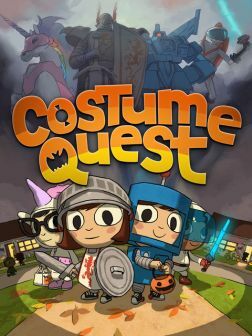 It means that I finally picked up (the XBLA version of) Double Fine Production's trick-or-treat-centric RPG, Costume Quest, earlier this week. I've been meaning to do so since the game was released nearly two years ago but, well, you know how it goes sometimes (especially when you have a backlog as extensive as mine). Anyway, none of that matters now. What matters is that I'm playing Costume Quest. Finally. And not only that, but I'm enjoying it. It's so completely cute and charming that it's all I can do to keep myself from puking (you know, because everything's so damn adorable) while working my way through Tasha Harris' wonderfully creative and nostalgic tale. The only aspect of Costume Quest that I'm not absolutely in love with at the moment: The QTE-heavy battle scenes. I wouldn't say I dislike them, but I also wouldn't say I like them as much as I would if they were, say, more traditionally turn-based. Oh, well, you can't have everything, right? Have any of you played through the PC, PS3 or Xbox 360 version of this game? If so, what did you think of it? I got this on PSN when it first came out and I loved it. I loved the idea of the kids' costumes turning into the real thing in battle, and I looked to forward to seeing how each new costume would turn out. Not massive, or groundbreaking or anything, just a lot of fun. The Art Direction's pretty cool, too. Hey there, Paul. Yes, I like the costume-turning-into-the-real-thing aspect of this game, too. I also loooooove the art style. The writing's good, too -- very witty. Also, I agree that Costume Quest isn't at all groundbreaking, but it doesn't much matter when it's as enjoyable as this is, right? This is one of those games I bought on a Steam sale awhile ago and just played a few minutes of before getting distracted. Seemed like it would be a good Paper Mario clone, and some day I will actually play more and find out. As I recall, the battle system is turn-based, but if you hit buttons at the correct time, you can do extra damage like in Paper Mario. Am I way off-base with the comparison? I bought this last year and totally forgot to play it last Halloween so I'll be playing it myself as well as part of my horror month, right after I finish Siren 2. No, you're not off-base with the comparison, warp. I just didn't make the connection when I first thought of the two games, I guess. At this point, I have to say I much prefer Paper Mario's battle scenes to those in Costume Quest, but that could change as I spend more time with the latter. It's a great holiday ritual! I have it on Steam, but haven't played it yet. Now might be the perfect time to bust that out, huh? Although quick time events are my least favorite video game trend EVER. Ah, it'll be interesting to see if I end up agreeing with you when it comes to this game's battles. So far, they aren't annoying me, but who knows what will happen as I continue to play it? I haven't found the lack of voice acting to be an issue, nor have I found the speech bubbles to be too speedy, although I have heard that complaint elsewhere. I'll have to pay closer attention to the latter next time I play the game. Hey there, Justin! This kind of surprises me -- that you have a game you haven't played. I thought you rarely do this? Anyway, I wouldn't say the battle scenes in this game are full-on QTEs. They're more like turn-based battles with QTE elements -- *kind of* like Paper Mario, but not as fun. Does that make sense? As far as having games that I haven't played, it depends on the medium. PC games, games on Steam, are most likely to be unplayed. I actually have about ten (maybe more) games on Steam that I haven't played yet. I bought them when the Steam HUGE sale was going on, and I haven't gotten around to them yet. I also have two or three games for the PS3 I haven't played yet. Bioshock 2, Uncharted 2, and Assassins Creed Brotherhood come to mind. And there are MANY I haven't finished yet. Ah, well, that makes sense. I do think downloadable games are especially prone to going unplayed -- at least for a while. It certainly sounds like you're doing a better job than I am at the moment, BTW. I really should stop buying games until I've played the mound of unopened ones in our basement, but I can't help myself!